Emily is three! I can't quite believe it, when you have children they say that time flys and they were not kidding. It has gone so fast. I found this year so much harder when picking a gift for Emily. She had asked for a few things, but they were only small things. I searched and searched for things that would make good gifts for Emily, and thought that I would share with you a few of the things I ended up getting for her. The Birthday Theif will have your little one absolutely astonished when they start reading their birthday story and discover that it is all about them. it can be personalised with your child's name, age and you get to pick the character you want to represent your child. Each story is unique, has a curious cast of characters personalized to your child's birthday. So little ones who are born in June will encounter his royal highness, Lord June. While September children will meet Sir September. I love these wooden jigsaws, Emily has the A-Z ones and it is so durable. It has taken a right bashing by Emily and it still looks brand new. It is brightly painted and each piece has a number so your child can learn counting and essential motor and problem-solving skills through play. I found this one on Born Gifted which has a selection of gifts suitable for every occasion and age. I would definitely recommend checking it out if you are looking for a gift. Paint sticks created by Little Brian come in a variety of colours, children of all ages can paint with no need for water, brushes or the mess that goes with it. Which makes them fab for travelling, it is really easy to pop them in your bag and take them out with you. The sticks are easy to twist up and down to get the paint out - similar to a glue stick. The paint drys within 60 seconds of touching the surface, the paints can be used on all surfaces such as paper, card, canvas, wood and even on windows as it can be washed right off. If you're a regular reader, you will know Emily loves Sylvanian families, she has lots of the different animals, the lighthouse, car and cosy cottage. I knew that she would love this ice cream shop, as it extends her play, but also gives her the ability to play with the little ice creams and serve them to her little animal families. It has been her favourite thing to play with recently, and she loves to create little stories. I was worried about her playing with the little items, especially encase she left them on the floor and Isabelle got hold of them, but she has been fab and keeps them in a little case when she isn't using them. I really love Sylvanian Families as they will grow with her as she gets older. Itty Bittys are adorable mini plush toys. 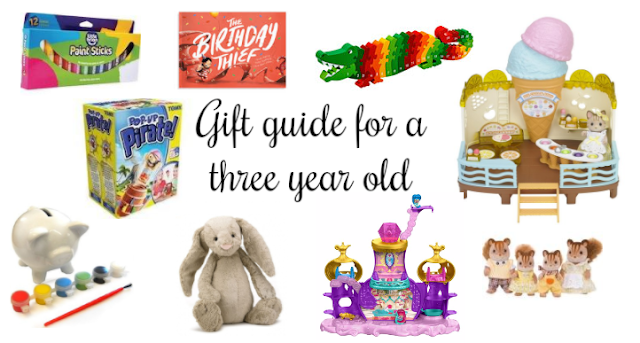 They make the perfect little gift and there are lots of various collections such as star wars, marvel, peanuts and snoopy, wizard of OZ, DC comics and Scooby-Doo. They are pocket size and take up no room at all as well as being super cute. They have just released a superhero girls collection which includes Emily's favourite wonder women. If you are a longtime reader, you will know Emily is really attached to her bunny. It's a blossom jellycat, and he is brown. She has been asking for another one for ages, and while I know he won't be anywhere near as good as 'her' bunny. I know she will love him. When I saw this plain brown bunny I knew it would be perfect for Emily. Pop-up pirates is a retro game that both Sam and I used to love when we were young - so naturally, we both wanted to get it for Emily, especially as she is at that age where she is really interested in games. The game is really simple but effective, all you have to do is pick which colour sword you want to be, and then take turns in a group to slide the sword into the barrel. You always need to be on guard as one wrong move may poke the pirate and send him flying out of the barrel. Whoever sends him flying is the loser. Little genies can create the most magical adventures with teenie genies floating genie palace playset, inspired by shimmer and shine's genie palace! there's plenty of flying and floating fun, and lots of rooms to explore! For genie-rrific surprise, when little ones pull down on the palaces pillow, shimmer and shine will magically float from the living room all the way up to the mirror room! Emily loves to make the genies float, and has had lots of fun playing with the palace - it honestly will make the best gift for other three-year-olds. Emily loves creative things, she loves to paint, and draw and make things. When I saw this piggy bank on the find me a gift website, I knew it would be the perfect gift for Emily. It was actually one of her favourite gifts, and it was something I wouldn't have thought about getting for her if it wasn't for the website. Emily has many of the families, and always loves to add new ones to her collection. The walnut squirrel family has been the perfect addition to her set. She loves to play with the various toys and I would definitely recommend purchasing a few of the various families to aid the play if you are planning on buying a play set such as the cottage. Ahh my girls love Sylvannian families too! I remember loving them the same as a child!